The Spa-Francorchamps / Belgium based Mühlner Motorsport Team celebrated an outstanding success at the 43rd ever participation in a 24-hour race in the long history of the squad around Renate-Carola and Bernhard Mühlner. Both from H&R Special Springs, the suspension manufacturer from Lennestadt in the Sauerland region, supported Porsche Cayman GT4 of the Mühlner Team run like clockworks and the seven drivers did not make any mistakes despite the occasional difficult weather conditions. 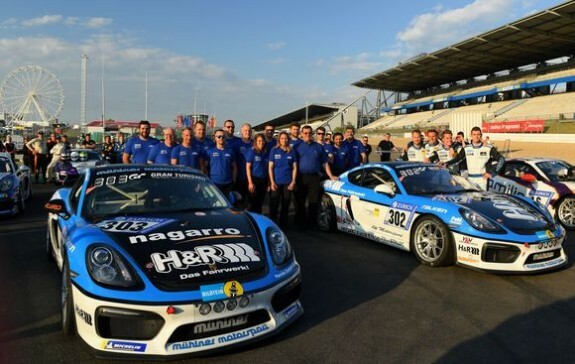 The Porsche Cayman GT4 #302 was piloted by Michael Rebhan (32 / Sulzbach-Rosenberg), Timo Mölig (24 / Waldalgesheim), Tobias Müller (20 / Euskirchen) and Moritz Kranz (30 / Linz am Rhein) and on the sister car #303 father Jürgen (59 / Wehrheim) and son Sebastian von Gartzen (25 / Gießen) shared driving duties with Marcel Hoppe (39 / Lennestadt) and double starter Moritz Kranz. Already after the qualifying it became apparent that the way to victory in the very crowded Cup 3 class would only lead over the team from the Belgian Ardennes, as the Cayman #303 could secure pole position with driver Moritz Kranz and the Cayman #302 of the Mühlner Team drove the second fastest lap time with Tobias Müller behind the steering wheel and thus both H&R Cayman started from the first row of the grid. The race itself was not as easy as one might expect; the competitors were mostly very fast, so that the leadership changed frequently in the first few hours of racing, before the two H&R Cayman could start to build a little gap to the pursuers. As the weather changed and heavy rain set in, all the drivers in the Mühlner team adhered to the pre-race march route, not taking excessive risks and driving calmly not to risk incidents. Other teams therefore scented their chance and blew to catching up, which, however, the Mühlner team did not cause to change the strategy. One of the competitors not only managed to catch up with the two H&R Cayman GT4, but even overtook both of them and another competitor, who was in fourth position, came very close again to the two Cayman of the Mühlner team, providing suspense and action. 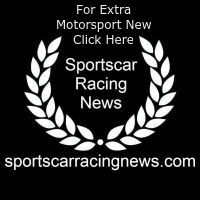 The prudence of the Mühlner riders, who kept to the discussed strategy and the decades of experience of the team on the Nürburgring Nordschleife should ultimately pay off. The competitor, who was temporarily in first place sailed eventually off the track and damaged the car so strong that he was out of the race. The temporarily fourth-placed team made wrong decisions about the tire strategy which caused two additional pit stops. Since other competitors also had technical problems, only the two H&R Cayman of the Mühlner team were in the lead lap on Sunday morning. Heavy fog then forced the race director to stop the race about four hours before the end with the red flag and when the race could be restarted; there was a 90 minute showdown. At the time of the interruption, the H&R Cayman #303 (von Gartzen / von Gartzen / Hoppe / Kranz) performed in front of the sister vehicle #302 (Rebhan / Mölig / Müller / Kranz), but in the final 90 minutes sprint, Tobias Muller took in the #302 Cayman a higher risk than veteran Pro driver Jürgen von Gartzen in #303 and thus saw the #302 the black and white checkered flag first and the #303 then brought a short time later the double victory home to the ambitious Mühlner Motorsport Team. “What a great result in our 43rd participation in a 24-hour race, first the double pole in qualifying and then the double victory in the race. All involved, the entire crew and the drivers, have made a faultless job and this is the only way to win against strong competitors. I am very proud of every single person who contributed to this outstanding success. Without our sponsors and here in the first place the H&R Spezialfedern GmbH and Co.KG from Lennestadt but also all other team sponsors and the sponsors of our drivers this result would not have been possible “, summarized Bernhard Mühlner after the race.